This chapter is built on the author’s experience as a CEO of SME Connect to underscore the fundamental problems of the traditional sources of funding for SMEs. 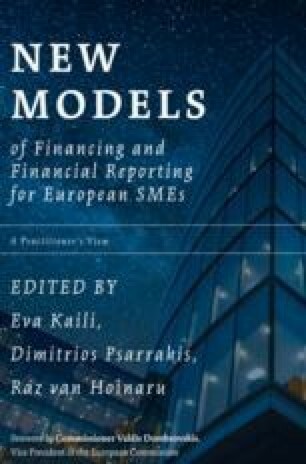 Among the mentioned problems, the systematic consequences of the banking regulations that followed the financial crisis are underscored—more specifically, the fact that the Capital Requirements Directive (CRD) led to the reduction of available lending and increased the cost of lending for SMEs. Also, the Basel III regime puts SMEs in a disadvantaged position compared to bigger corporations. Alternative sources of funding, thus, are of paramount importance. The main challenge for SMEs is the fact that the offers are often confusing, although access to COSME has already been simplified. Entrepreneurs still have to find the right funding, which means that the opportunities for funding should be even more transparent. While debating access to finance for SMEs, we must not forget other important issues here: fair and lower taxation, less bureaucracy, and the cessation of late payments by the governments. SMEs can help themselves, if one lets them. In the end two things are highlighted: the freedom for entrepreneurship and the supportive structural programmes and instruments that EU deploys to strengthen the SME ecosystem.